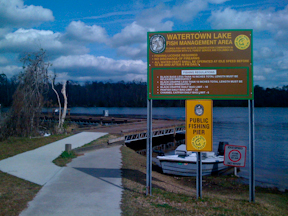 Watertown Lake sits along the western border of the Osceola National Forest at Lake City and is a popular place for fishing, as it has both a boat ramp and pier. Fishing is overseen by FWC. Restrictions: Parking is shared with a private lodge. Be respectful. Permit Info: A valid Florida fishing license is required for fishing in Watertown Lake. Here's the our members favorite photos of "Lakes in Wellborn". Upload your photo of Watertown Lake!